Great progress has been made in the quest to open up government data in recent years. Great progress has been made in the quest to open up government data in recent years. Publicly funded data sets that were once locked away from public view are in many cases now available to the general public, academics, analysts and journalists alike. The Guardian Datablog in particular has pioneered the use of these open datasets and often raised awareness of important matters of public interest by analysing, visualising and mapping them. For example, The Guardian’s use of open data in examining the English riots of 2011 provided a depth and breadth of insight that only a few years ago would have been impossible. Similarly, The Telegraph has also sought to free important national datasets; in 2012 they published a national map of the English green belt and made it available for download for the first time. When new constituency proposals were announced in 2012, The Guardian and the Telegraph even collaborated to produce the first interactive online map of the changes. Most recently, the Land Registry announced plans to release their entire archive of ‘historical price paid data’ going back to 1995 – all 17 million records of individual properties sold during that time; a development that data consultancy GeoLytix called the ‘most significant open data announcement for years’. It seems strange, then, that HS2 – the public authority responsible for delivering and promoting the second phase of high speed rail in the UK – should adopt what appears to be a rather byzantine approach to releasing geographic data on an issue that is almost entirely about location. At present, if you want to download data and map the route for the initial HS2 preferred routes from the West Midlands to Leeds and Manchester your first port of call ought to be a small webpage created by a man named Barry Cornelius and not the official HS2 website. The route data for the proposed Leeds and Manchester sections of the line was available via data.gov.uk for a short while, but it soon disappeared. Trawling the web trying to find a reason for this leads to tantalising clues but no definitive answers. The fact that Barry Cornelius writes on Stop HS2 that his website ‘offers the easiest way of finding how close the HS2 comes to a particular place’ does of course suggest a use contrary to what HS2 might have hoped for. However, since the location data for HS2 is available under the Open Government Licence, users are entitled to use it as they see fit and this kind of scrutiny was, after all, part of the rationale in opening up public datasets in the first place. One might reasonably draw the conclusion from this episode that HS2 are keen to prevent people producing highly detailed interactive maps of the preferred Leeds and Manchester routes. The Government’s own data.gov.uk HS2 data download page now points to the HS2 website where interested parties can request the routes via e-mail. I requested this data on 27 March 2013 and as yet have received no data. I understand that other potential users are in a similar position of having had no response within the statutory 20 day response time, as set out in the Freedom of Information Act 2000. This is not an uncommon situation, since public bodies are often inundated with requests – sometimes frivolous – for data they hold, but it seems indicative of a wider problem with public data which are ‘open’ in theory but not in practice. The bigger question here, then, is why route data for a nationally significant infrastructure project are not available for download from the organisation responsible for delivering and promoting it. If open data is to fulfil its promise of enhancing transparency and accountability in government it must be open in every respect. If it is not, and no clear reasons are provided, claims of subterfuge and chicanery will inevitably arise. What’s my agenda here? 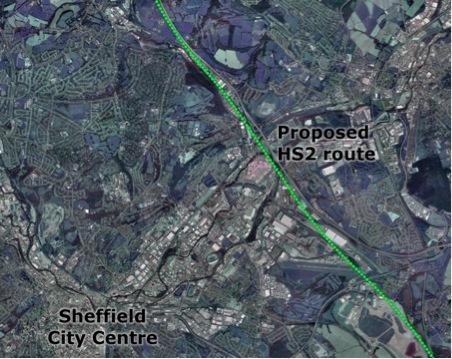 I’m an academic at the University of Sheffield who analyses spatial datasets, and not a pro or anti-HS2 campaigner. I am an advocate of open data and the enhanced level of transparency and accountability it can lead to. On balance, I’m probably marginally for HS2, though I remain somewhat ambivalent overall.